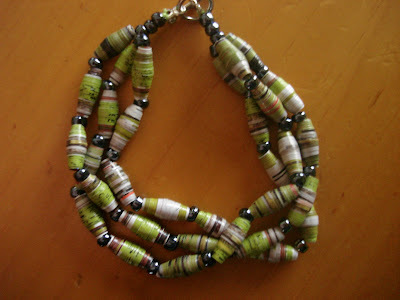 This is just a cute little bracelet that I made for myself out of paper beads. I heard about them for the first time a few months ago and once I learned how to make them I was obsessed for a few weeks. I have a lot of beads just waiting to be put together into a necklace or bracelet for someone. I made a cute little bracelet out of leftover scrapbook paper for my sister-in-law Stacey but I neglected to get a photo before I gave it to her so I will update this when I can. 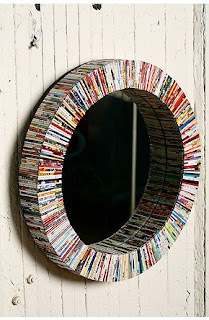 Basically, all you do is collect magazines, catalogs, etc... and cut the pages into long, thin triangular strips. Mine were about 1/4 inch wide [tapering down to a point] by 11 inches long. Begin by rolling the wide end of the triangle around a wooden skewer, I secure with a small dot of glue after the first wrap around (regular white Elmer's glue). Then roll tightly and glue the tip down, rolling the "bead" around to get a thin layer of glue all over the entire surface of the bead. Pop the bead off of the skewer and allow to dry completely. Then I paint a coat or two of acrylic varnish over the top. Thats most easily done on wire so it can easily slide off for use later. [They tend to stick to the wooden skewers and unravel if used in this step.] One site I saw used a styrofoam cup with wire stuck in the sides as a drying platform. That worked really well for me. It was fun experimenting with different shapes, paper types, colors, etc. Now all my junk mail catalogs look like bracelets to me. (Wrapping paper too.) I did end up with a bead that had some lettering on it from a catalog that used to say "square assortment" and wouldn't it be my luck that completely unintentionally that phrase ended up on my bead with the last seven letters of assortment left off...Ohh...Can't use that bead in a gift bracelet now. Hee hee. I'm sure I'll have a lot more fun making beads that, knowing me, will sit around in a box and never get made into anything. Oh well. I tell myself I'm recycling and then I don't feel so bad. 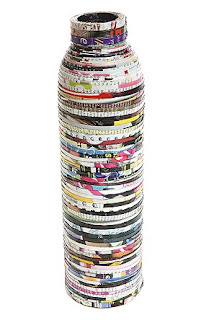 Do a google image search for "paper beads" and you'll be surprised at how creative people can get with these things!